What’s up with Mother Nature? Has she forgotten to look at the calendar? It’s January, and she should be full of bitterness and coldness and frigid wickedness. Instead, it seems Mother Nature is having a bit of hot flash, teasing us with a taste of a spring fling. 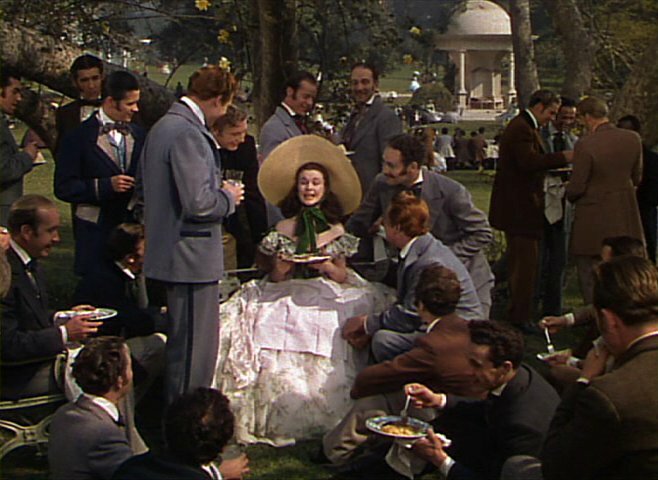 That’s why I’m more inclined to envision Mother Nature as Scarlett O’Hara, flitting and flirting her way through the folks at a Twelve Oaks barbecue, while I am one of the admiring suitors gathered around her. My heart beats with every flutter of her eyelashes. My pulse races with each giggle of her southern feminine charm. The temptation is overwhelming. I so badly want to reach out and grab my rake to clean out the flower beds, to let my fingers sift through the soil, to plant seeds and to nurture them to full growth — and I want to do all of this without the protection of work gloves. I am hungry to be in the garden. The truth is, Mother Nature, like Scarlett, is not going to keep up this charade. She’ll get a better offer in some other part of the world, exclaim a few “fiddle-dee-dees,” and be gone with the wind, the breeze from her crinolined skirts ushering in a deep-freeze blast of winter. Her departing giggle will be a constant reminder at how close I came to caving in to spring fever. “I’m as restless as a willow in a windstorm; I’m as jumpy as a puppet on a string. I’d say that I had spring fever, but I know it isn’t spring. Oh why should I have spring fever, when it isn’t even spring? Hearing words that I have never heard from a man I’ve yet to meet. I’m as busy as a spider spinning daydreams, I’m as giddy as a baby on a swing. Huh? But I have seen a crocus. In fact, I’ve seen a couple. They may not have flowers, but their grass-like leaves have emerged just outside of the dining room window. And there are a few other hints of green sprinkled about. Well written, my dear! Curses is right…my back was killing me after planting daffodil bulbs this past fall and now they are poking their little heads up WAY too soon. Only the green is showing, so I hope they will still bloom in the spring. Michele — blooming beauty is not without its price. By the way, I think as the temps drop, the bulbs slow down. With some warmer weather, they start up again. Good luck with them. I love this posting. LOL! I hope we will not have to pay for this fab weather later Kevin. My garden is completely confused about the warmer winter. Excellent post!! Clever analogy 🙂 I have been doing some transplanting and some cool-season veggie planting, but I’m chomping at the bit to do more pruning, which must wait till the real spring comes forward. Until then, I just keep saying to myself … Step away from the Felcos! Toni, so glad you enjoyed it. I also laughed at your comment. Each day I find myself talking myself down off the ledge. Cheers! Kevin, I am tempted to say it might as well rain until September but no I’m not going to as we get plenty rain over here. We are also sharing the mild weather with you, helluva winds though. What’s wrong with you all, if its Spring like do a bit of tidying up in the garden, the difference it makes is amazing. If anyone else is like me, I do little bit of cleaning — but the bigger projects will wait until spring. No turning the soil or moving mulch away from perennials just yet — only picking up some branches and leaves. It’s actually been rather dry here, and the temps are all over the place. It was about 16 degrees F earlier in the week, and then near 60 degrees F over the weekend. Cheers! Well, I hate to admit it, but I fell to her charms. I started pruning my roses – a month earlier than the traditional time. I’m certain I’ll get burned, stung, my heart pulled out, when a cold front finally comes through. But until then, I’m singing away, having a blast with Mother Nature right now. The Ol’ Gal has still got it. I hope the pain won’t be too great once she decides to wear her winter white. Kevin, I have seen a crocus too, in fact, I have see three, in full flower, in my garden here in London 🙂 There are around 297 more to go, but they are all more or less above ground and if we don’t get any frost they will all flower in matter of weeks! Wow, that sounds like a beautiful display — for spring. Here’s hoping that Mother Nature won’t interfere with your garden plans. Happy 2012! For sure, the calendar seems meaningless, these days, Kevin. Love the Clooneyness of your piece. Wonder if we’ll be humming “Winter Wonderland,” come summer. Don’t even put that in the universe! 🙂 Although I’m not a fan of cold weather, some snow would be nice, if only to provide a nice slow watering as it melts and seeps into the ground. You expressed my thoughts exactly, sort of! Today I was feeling the warm air and watching daffodils grow, but I’m telling you, there’s a hard frost coming! It’s too soon for all this plant activity. P.S. Thanks for introducing me to Lee May’s Gardening Life! I’m glad I could help. His blog and his writing and his gardening passion are inspirational. Enjoy! We’ve had a few days recently that felt more like spring than winter and boy, I can sympathize with wanting to get out and start digging. Amazing how quickly spring fever set in despite the fact that we’ve barely started winter. It’s true. When spring fever hits, it comes on fast and furious. Shame on Mother Nature for toying with us. Love the analogy to one of cinema’s finest women! 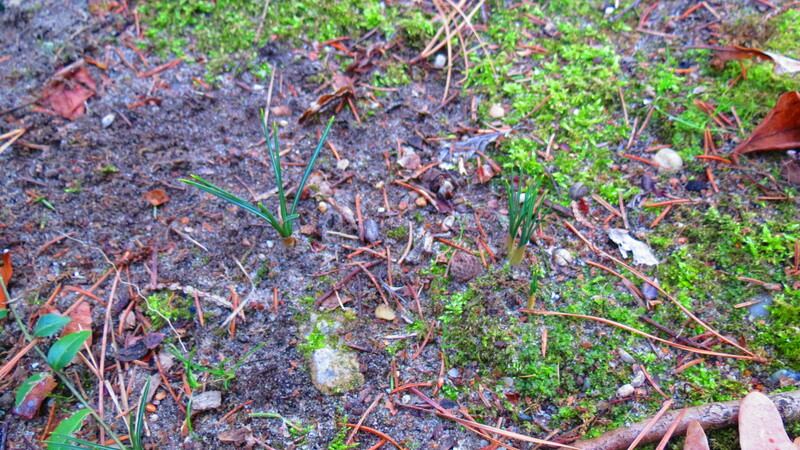 My crocus foliage comes up every October…I thought they all did? We had 57* this afternoon, but are now under a Winter Storm Warning. It was wonderful, while it lasted. Mother Nature giveth and Mother Nature taketh away. Stay warm and safe. would want wishy-washy Ashley Wilkes when she could have Rhett Butler! I could never understand why any woman would fancy Leslie Howard when there was his much sexier cousin Trevor Howard (Brief Encounter) available? Why I am talking films when I should be talking about gardens…. Janet, thank you so much. The Ashley/Rhett issue is probably one of the greatest mysteries of cinema. Even “Rosebud” from Citizen Kane isn’t that much of a mystery. Be well — and happy movie watching. Kevin, this was such a nice post. I am very visual and found this post very entertaining. As always, you never disappoint. You are one of my ‘not to be missed’ writers. Debra, glad you enjoyed the post — and many thanks for your kind words. I am truly flattered and honored. Cheers!